STAY AT HOME MOM: Pillsbury Sweet Moments Review & Giveaway - ENDED! Pillsbury Sweet Moments Review & Giveaway - ENDED! 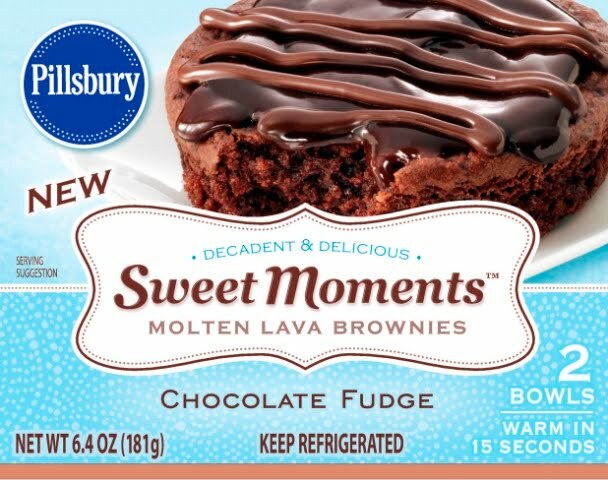 Pillsbury introduces two new ways to enjoy life’s little luxuries with Sweet Moments Bite-Size and Molten Lava Brownies! Pillsbury Sweet Moments, now available in the refrigerated baked goods section of your local grocery store, are perfect for indulging any time of the day. The Bite-Size Brownies, which are layered with either rich caramel or fudge and chocolaty coating, are just the right size to grab and go for a quick pick-me-up. They’re ready to eat, so are ready right when the craving strikes – no preparation necessary! And, at 60 calories per brownie, they’re just enough to satisfy your sweet tooth. And to reward yourself for a busy day well spent, try a Sweet Moments Molten Lava Brownie, which are served in single-serve bowls and are also available in rich caramel and fudge varieties. Each are covered in decadent chocolate or creamy caramel and topped with a chocolatey drizzle. After only 15 seconds in the microwave, the brownie bowls are warm and ready to enjoy. When chocolate bliss is this easy, how could you resist pausing for a Sweet Moment at the end of your day? I received a VIP coupon for Pillsbury Sweet Moments from MyBlogSpark. I went to the supermarket and saw the Sweet Moments Molten Lava Brownie. And knew my kids would probably love it. After dinner they had them for dessert. Here is a picture of my daughter eating hers. As you can tell, she totally loved it! My son did too. My daughter took a bath last night, and loved smelling like chocolate! Win it: One lucky reader will win a VIP coupon for Pillsbury Sweet Moments, and the bath products described and shown above. Mandatory Entry: You Must Do This First- OR all Other Entries Will be DELETED! Please Share the time of Day you could use a quick pick me up with the new Pillsbury Sweet Moments. RULES: Giveaway is open to US Residents only. Giveaway ends August 31, 2010 11:59 PM EST. Winner will be chosen via Random.org. Must have valid email in blog profile or leave email in comments otherwise you will be disqualified. Winner will have 72 hrs. to confirm by email, If no confirmation in that time frame a new winner will be chosen. Disclaimer: I received the product, information, and prize packs from Pillsbury through MyBlogSpark.. I usually start to lose it about mid afternoon and this would be awesome to help it! I entered the Penguins of Madagascar giveaway. This would be perfect around 7:00 at night. I could use a pick me up about 3 PM every work day. i could have a sweet moments anytime, late afternoon is good to last me till end of the working day. I could use a sweet pick me up after college classes, and before I go to work. I could use a quick pick me up in the afternoon, right before my kids get home from school. After dinner, when I still have to clean the kitchen! About 9pm when the kids are asleep and I wont have someone coming in to say"mom,mom,hey mom what's that,can I have some? My time of day would be when I get home from work before anyone is home yet. There are two times of day around 4:30 in the afternoon and 2:30am when I wake up in the middle of the night and can't fall back to sleep. I would use them on my break at work because my job is so stressful! I would use them around 2pm. That's when I usually loose steam around that time everyday. I good use a snack about two in the afternoon. I could use a quick pick me up right before I pick up the kids from school! I usually need a little pick-me-up in the afternoon, around 3pm! The time of the day that I could use a sweet pick me up is around noon. I wake up at 5:00 am everyday and begin to get sleepy and need sugar or something sweet around noon as a bit of a pick me up. I entered the 7th Generation giveaway. I would love them around 3-4 pm, when the kids get home from school! I also entered your $25 Walmart GC giveaway! I need something at the end of the day. I could use this when I get home from work. I could use the quick pick me up in the evening after my daughter is in bed asleep! Just sit down and enjoy! There's a certain time every afternoon where I look at the clock and think "Do I really have to be at work for another 3 hours still??" and having a sweet moment would totally cheer me up and out of that funk! every night i crave sweets! matter of fact I have some of these in the fridge and im about to go munch on them now! Just before I go to bed, I like a little something sweet for sweet dreams. In the afternoon as a little snack break! I would like it in the afternoon as a quick pick me up. About the time that my kids get home from school. We all are in the mood for a snack then. i need a pick me up around 2 pm. The time of day? Anytime after 3 is bad for me so I would love a little pick me up! I joined your blog frog community #1. I am a member of your blog frog community #2. I could use a quick pick me up with the new Pillsbury Sweet Moment at 10 AM. I could use it late afternoon -- about 3 or 4 because that's always when I get super tired and have a tough time staying awake and focused at work! I subscribe to this RSS feed in Google Reader! I could use a pick me up during the time between lunch and dinner. That's when the snacking urge hits! I'd love to share this with my boyfriend as a bedtime snack! I get a little sleepy in the early afternoon so that would be a great time to have a bite! While watching TV or reading in the evening would be a good time! Around 2pm is when I could use a quick pick me up. These sound really yummy! I could use this as a snack in the afternoon, before dinner. I could use the pick me up at night after I put the kids to bed!